After Spain’s real estate market plunged in 2008, prices declined more than 40%. In 2014, prices leveled off, signaling to many investors an attractive point of entry. Many real estate funds were taken investments from an increasing amount of investors with low investments, so they decided to create a crowdfunding site. Spain’s real estate catastrophe indicates an optimal time for real estate crowdfunding, a system whereby individuals can invest in multimillion dollar deals for a fraction of the cost. Blackstone, Goldman Sachs, and GreenOak have been investing billions into the post-bubble fire sale of apartments, mortgages, and shopping centers. Last year, foreign investors comprised half of the $11.2 billion invested in Spanish commercial real estate. Historically, small local investors have been excluded from such investment. After the 2008 meltdown, banks tightened their mortgage standards, only giving 314,000 mortgages in 2014, down from 1.8 million in 2007, according to the Spain’s national statistics bureau, the INE. But, Spain hadn’t instituted all-encompassing crowdfunding regulations until April. Under these rules, investors, with annual income over €50,000 and liquid assets of €100,000 have no investment limit, while others can invest up to €10,000 annually. The total value of a project is limited to €5 million.Small investors are attracted to considerable returns from a tangible asset. But, not everyone thinks that real estate crowdfunding is a wise investment. Many claim that the best deals are reserved for large institutional investors, and that crowdfunding only complicates deals. Still, supporters of real estate crowdfunding argue that small time investors are now able to invest alongside institutions, reaping profits that were once restricted for them. 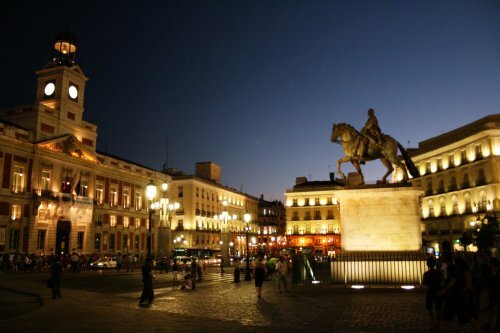 Plaza del Sol, one of the major points of interest in Madrid, Spain.